Geneva 2012: Hyundai Veloster Turbo | What Car? 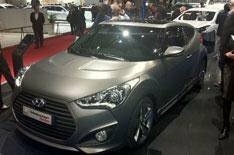 The Hyundai Veloster Turbo has been unveiled at the Geneva motor show. A US-spec Veloster Turbo was revealed at the Detroit motor show in January, however the model on show in Geneva is the version that will be sold to UK buyers. Powered by a 184bhp 1.6-litre turbocharged petrol engine, the Veloster Turbo can blast from 0-60mph in 8.4 seconds that's 1.3 seconds faster than the 138bhp non-turbo version. Hyundai says it has made improvements to the steering and suspension for the Veloster Turbo, and has tweaked the exhaust system to make the car sound sportier. The gear ratios in the six-speed manual gearbox have been widened to cope with the Turbo version's increased power and torque. The Turbo model has new front and rear bumpers and foglights, grille and rear spoiler. It also gets 18-inch alloys and LED lights in the headlamps and taillights. Prices have yet to be announced, while fuel economy figures and CO2 emissions will be revealed closer to the Veloster Turbo's launch in the autumn.